Cyronin Sintav, an Imperial commoner, is one of four nephews of Iniel Sintav living in the Elven Gardens District of the Imperial City with his wife, Carmana. 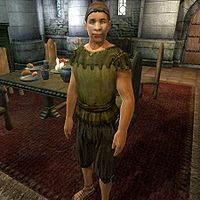 Cyronin has had a dispute with Helvo Atius, who lives in the Imperial City's Talos Plaza District, that has caused bad blood between the Sintav and Atius clans. Cyronin sleeps between midnight and 6am. At 11am he goes to The King and Queen Tavern with Carmana for his lunch, and stays there for two hours. Between 6pm and 8pm he has dinner on the ground floor of his house. On Tirdas and Turdas he goes to the Tiber Septim Hotel at 2pm and stays there for six hours, missing his dinner. On Sundas he will visit Uncle Iniel from 9am to 9pm. In his spare time he wanders around his house restlessly. This schedule is interrupted during Light the Dragonfires, when all Imperial City residents are confined to their houses by martial law. He wears a lower-class outfit consisting of a pair of braided leather sandals, a pair of breeches and a flax tunic. He carries the key to his house and a small amount of gold. When you approach him for the first time, he will introduce himself and make clear that he is not really interested in conversation: "Cyronin Sintav. I'm a Sintav. That's all you need to know." Because of his dispute with Helvo Atius, clan leader Iniel obviously told Cyronin to stay out of trouble. When asked about the Imperial City, Cyronin will add: "What Iniel says, goes. He says, lay off the Atius, I lay off the Atius. Simple." When approached, his wife will excuse her husband's rudeness beforehand: "I'm Carmana Sintav. Cyronin is my husband. Excuse him, please. He's a little irritable." What exactly happened between Cyronin and Helvo Atius remains unclear, but asking Helvo will give you a hint: "It wasn't my fault. Cyronin Sintav started it. But I'm the one who got caught, so I'm the one who has to cool his heels." Esta página foi modificada pela última vez à(s) 03h05min de 28 de dezembro de 2013.